Rail investigators are looking into the cause of at least three explosions on newly refurbished commuter trains. 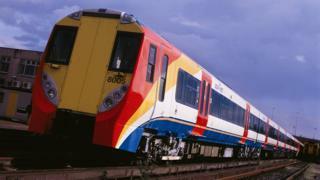 The Rail Accident Investigation Branch (RAIB) said there was a blast in under-floor equipment of a South West Trains service on 7 July. It happened as the Class 455 train left Guildford in Surrey and left debris, including "quite sizeable" fragments, in the car park and on platforms. The RAIB said smaller explosions had occurred on at least two other trains. It attributed the smaller blasts to a build-up of explosive gas within the traction equipment caused by a manufacturing defect. Class 455 trains have been undergoing a programme of retrofitting new traction equipment since May 2016. The RAIB said the traction equipment involved in the Guildford blast was of the new design and the mechanism which caused the explosion was believed to be understood by the parties involved. It added: "Industry parties were in the process of devising possible solutions to the problem at the time of the 7 July accident and are continuing to do so." No injuries were reported in the explosions.